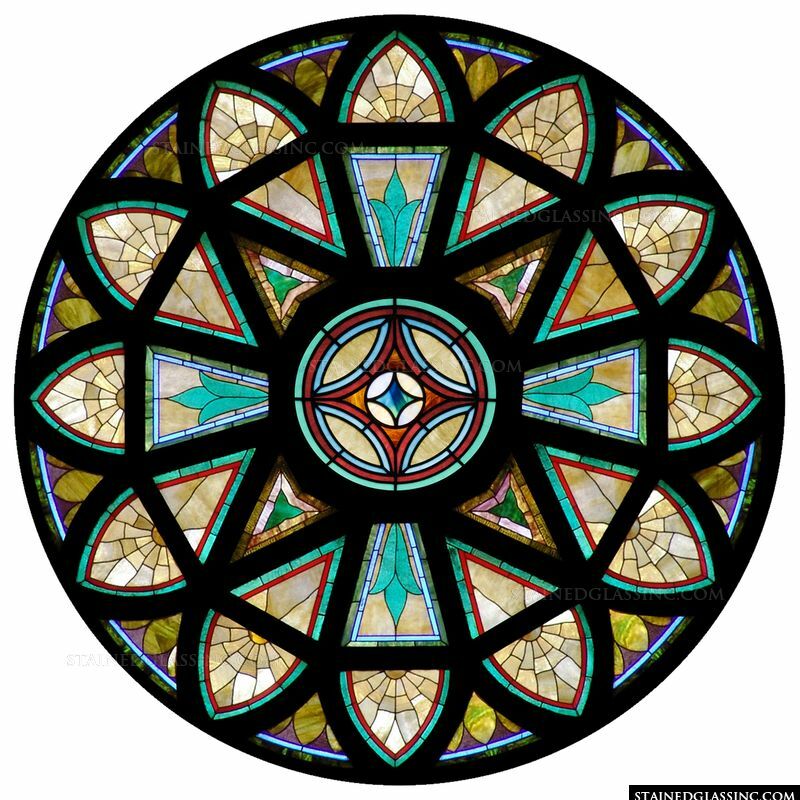 Although Stained Glass Inc. does not actually do stained glass dome restoration, the team can help rebuild a new stained glass dome based on the original design. This blog covers some of the reasons why we do not do restoration and why it is often a good idea to create a new stained glass dome instead. There are many beautiful, but old and damaged, stained glass domes that are in need of repair or restoration. Often, these antique domes are covered in dirt or are fragile or broken. The process of restoring a stained glass dome may involve something as simple, although time-consuming, as a good cleaning to remove grime and debris. 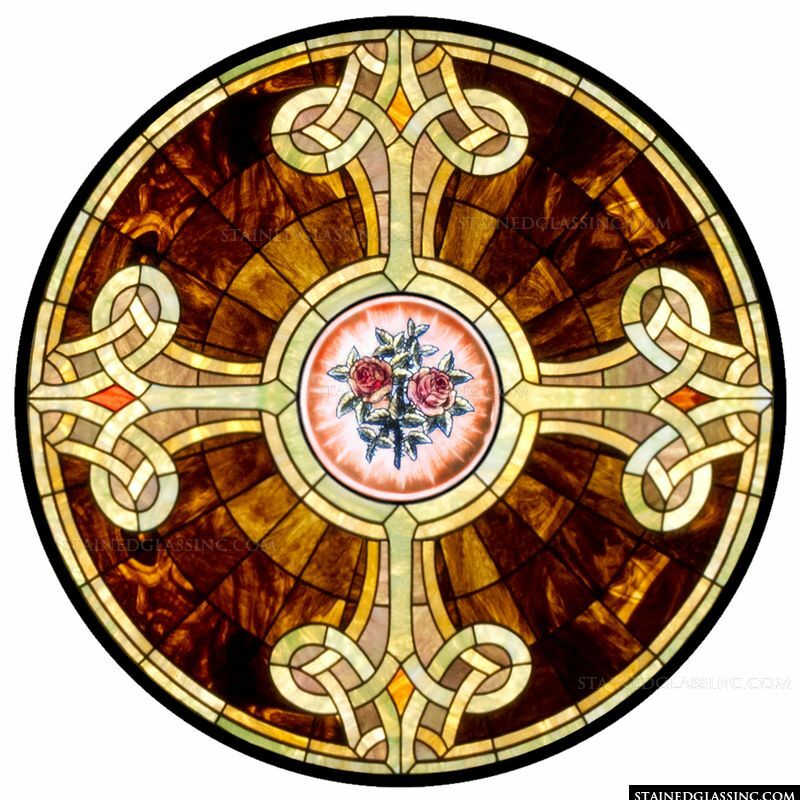 Other times, pieces of the stained glass dome may have faded color or have been broken and are in need of replacing. Even more complicated is that the stained glass dome’s structure and support system may be deteriorating, including the frame. If the dome is very old, it may be that the glazing sealants were also inadequate to protect the stained glass dome. Stained Glass Domes: Restore or Replace? There are many things to consider before deciding whether a stained glass dome should be restored or replaced. The older the stained glass dome may be the more work and cost will be necessary to restore it to its original beauty. The cost and effort may be too much for the budget, depending on the extent of restoration work that may be needed. In many cases, the better alternative would be to completely replace the stained glass dome. This could provide a cost-effective alternative that also takes advantage of new technology and materials that are environmentally-friendly, free of lead, and offer a longer life for the stained glass dome. While we do offer an extensive range of stained glass dome designs, our team of seasoned stained glass professionals and artisans also enjoy making custom stained glass dome designs. That means that we can work with a stained glass dome design that you have in mind. This is an excellent alternative when you may need to consider completely replacing an old and damaged dome. The stained glass dome design you may have can be recreated by our stained glass master craftsmen. Beyond just recreating the stained glass dome design for you, we can also size the dome to fit your existing space. This is because our domes are made from modular pieces so you do not have to think about any construction to make a new dome fit in the old dome’s space. Another advantage to having us recreate your stained glass dome from scratch is that we use polymers that are stronger than originally used in your dome as well as advanced adhesives and structural materials beyond what is required from existing safety standards. This means the new stained glass dome will withstand more and last longer. To learn more about replacing your old stained glass dome with an environmentally, energy-efficient, stunning new stained glass dome and to receive a free estimate, contact us now! Fill out our contact form or call our team of stained glass specialists at 903-454-8376. Beautiful custom stained glass domes can be created to fit your specific style and taste. 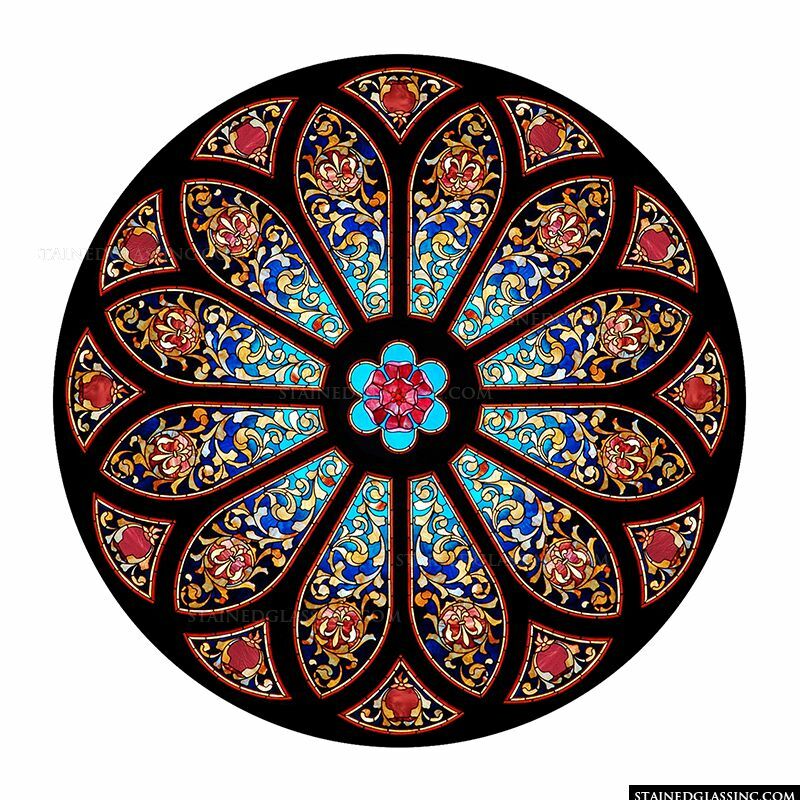 While Stained Glass Inc. offers every design and style imaginable for stained glass domes, including traditional and modern styles as well as religious and non-religious designs, we are known for offering a completely custom service for stained glass domes. • What do you want to express with your stained glass dome? For instance, are you trying to add ambiance to a restaurant or hotel or are you looking to enhance the interior design on your home? Do you want to highlight a religious or inspirational message for your church? 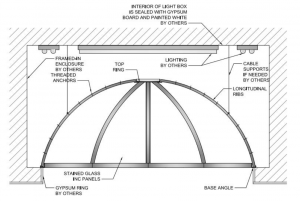 • Where are you putting the stained glass dome in your structure? This may determine the size and scope of its design as well as the colors. • What type of light source do you want and when will it mostly be on display? You don’t have to rely on natural lighting to enjoy a stained glass dome because artificial lighting can back light the dome. This also allows the dome to be enjoyed in the evening, which is often necessary for a restaurant or casino. To create a signature look for your stained glass dome that you will not see anywhere else, you can work with our team to design a stained glass dome that represents your brand, location, and type of business or personal style. Because we use a modular design process, we can create just about anything you can imagine. Everything about our custom stained glass domes is about your personal specifications, including size, pattern, and colors. You can provide an example as a rendering or sketch or our artists can create a picture. Our customization process also includes designing the dome for a natural light source, an artificial light source, or both. The Benefits of Partnering with Stained Glass Inc.
• No lead is used in the stained glass production process, offering safety and health benefits. • The polymers used are stronger than regular glass and deliver higher impact resistance. • The team of stained glass professionals has extensive expertise and skill in crafting stained glass, using traditional processes and modern technology. • The company has created some incredible stained glass for clients all over the world in a wide range of applications and structures. • Our team is friendly, knowledgeable, and responsive, so you know your image, technical, and installation questions will be answered and you will be able to enjoy the design, ordering, delivery and installation process for your custom stained glass dome. • We provide complimentary design consultations as well as free quotes. To find out just how easy it is to design and order a custom stained glass dome, contact our team of stained glass professionals now to get more information, receive a free custom quote, and discuss your ideas. You can reach Stained Glass Inc. by filling out our contact form or calling 903-454-8376. 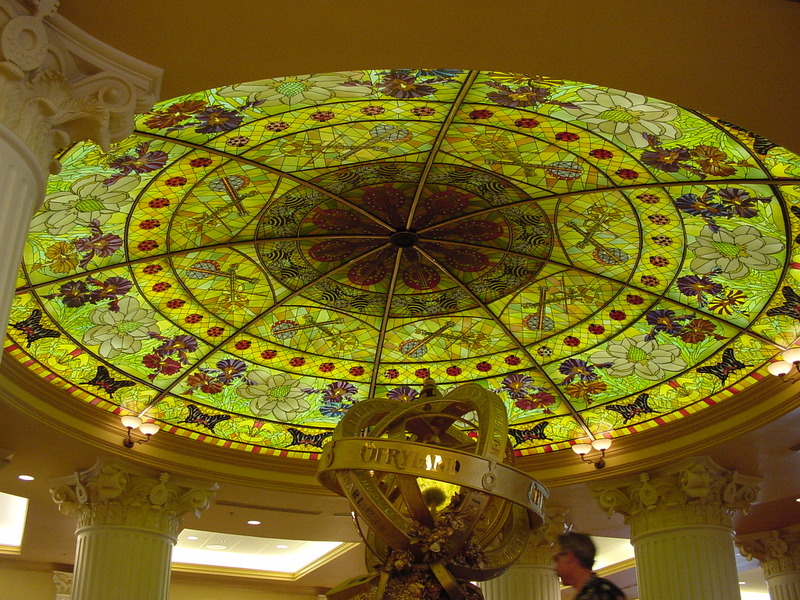 Stained glass domes are often featured in hotels, casinos, restaurants, libraries and other spacious locations. However, these same colorful, bright, and dramatic domes can also become a beautiful architectural feature in your own home. The stained glass domes offer a range of benefits for any home style or size. The elegant domes add a unique focal point and set your home apart. Placed in a foyer or solarium, any guests to your home will immediately be in awe of its sheer beauty and dramatic effect. The light source produced from the stained glass domes brighten a home and change the mood of any space. The light source can be natural or artificial, depending on the style and size of your dome. Domes can be used in numerous spaces to change the lighting effect of those areas throughout the day, including a master bedroom or bath, library, or staircase. While you may think that designing and installing a stained glass dome for your home will be expensive and involve significant remodeling or construction costs, we have made both processes very easy and affordable. Everything about our stained glass domes can be completely customized, including virtually any shape. While offering a catalogue of hundreds of stained glass designs, you can also submit your own stained glass design idea that matches your personal interior design. Our designers work with you directly to ensure the design is what you envisioned. And, you do not have to change the structure of your house just to enjoy a stained glass dome. Instead, the dome is created in panels that work as part of a grid system that has been designed to fit your space. 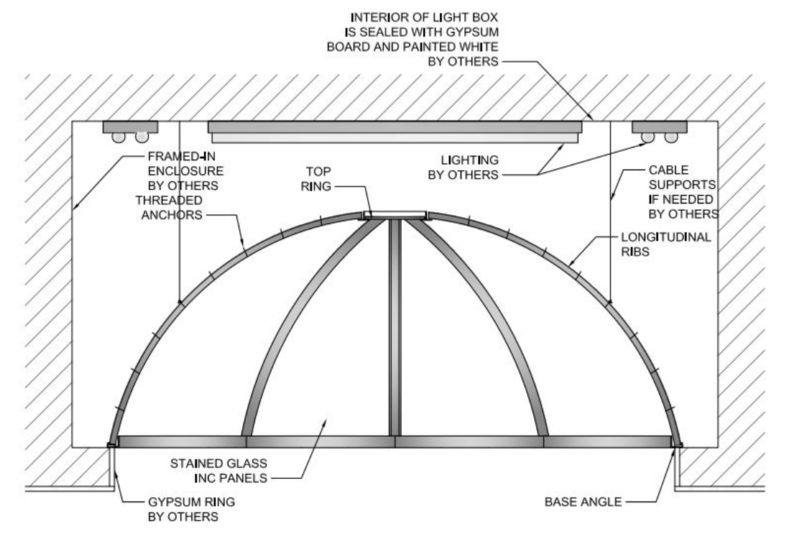 When installing a dome that relies on natural light, it can be placed directly below an existing skylight in your home. If you choose to use artificial light, such as LED lighting for your dome, it can be placed anywhere in your home because no opening in the roof has to be created to enjoy it and it can be controlled with the flick of a switch. You even have the option of creating a stained glass dome that uses both natural and artificial lighting. This way, you can use the power of the sun to illuminate the dome during the day but still enjoy it in the evening hours thanks to the artificial light source that has been added. Discover the beauty, luminous color, and craftsmanship of stained glass domes for yourself by getting a free estimate from Stained Glass Inc. To learn more about custom ordering, design possibilities, and ease of installation, you can either fill out our contact form or call 903-454-8376. Stained glass domes are a stunning architectural feature and extraordinary work of art that is sure to impress any casino guest as soon as they step foot in the gaming area, entrance lobby, or buffet area. Beyond the beauty, ambiance, and warmth these stained glass domes offer for a casino, they are an excellent way to bring in natural light or add color by backlighting the ceiling area where it is located. 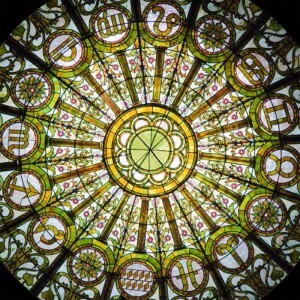 Stained Glass Inc. has designed, customized, and manufactured stained glass domes for casinos all over the country and the world. Stained glass domes help showcase various parts of the casino to help it stand out among the competition in a city full of casinos. 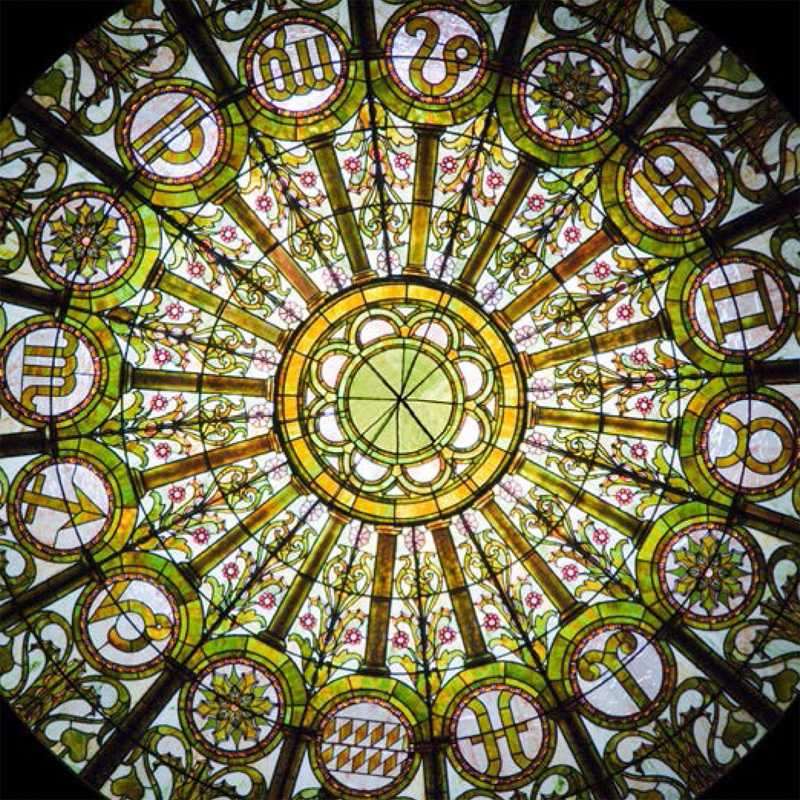 Beyond enhancing the casino’s brand image and overall appearance, a stained glass dome can help change the feeling of a space. Stained Glass Inc. has a gallery of existing dome designs or you can work with our stained glass design specialists on a custom design. For example, if a casino wants to create an intimate space, such as a bar or club area, the stained glass dome can focus on dark colors and the ceiling can be lowered to bring the dome closer to the guests. However, if the casino wants to create a grand and spacious effect, lighter colors and a higher placement of the dome within the structure can open up an area of the casino, including a lobby, main gaming floor, shopping arcade or restaurant. When thinking about how to install domes, it used to require a lot of construction and careful planning because the domes were heavy and required remodeling of the existing casino structure. Once placed, the stained glass domes would then need some type of support structure to keep it in place. Thanks to Stained Glass Inc.’s modular stained glass dome construction, installation is now easier than ever. Our stained glass domes are lightweight, which means no heavy equipment and only simple architectural support needed to hold it in place. Because the stained glass dome is custom made to fit your existing space, there is no extensive remodeling work required. Stained Glass domes are made from a polymer blend that adds to their durability. For stained glass domes that come in contact with the external environment, the domes have been tested to withstand a range of weather conditions. Our backlit stained glass domes are designed to be installed within a building and use LED lighting that can last up to 30,000 hours before bulbs need changing. For an estimate or more information on how your casino can enjoy the beauty and durability of a stained glass dome, please fill out our contact page or call us at 903-454-8376. Our stained glass professionals and design studio specialists are standing by to work with you on adding the beauty, opulence, and grandeur of a stained glass dome to your casino.